Put simply a constituency is an area whose electorate (all the people in an area who are entitled to vote in an election) vote for a representative or representatives to a legislative body. 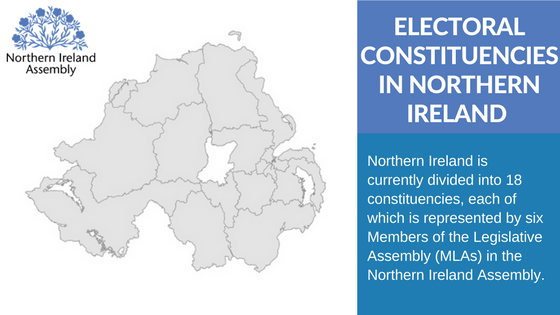 Northern Ireland is currently divided into 18 constituencies, each of which is currently represented by six Members of the Legislative Assembly (MLAs) to the Northern Ireland Assembly. However, following the 2017 election on 2 March the number of MLAs per constituency will be reduced to five per constituency. This is a result of reforms agreed in the Stormont Fresh Start Agreement (November 2015) and subsequently passed into law in the Assembly Members (Reduction of Numbers) Act. While the number of the electorate in each constituency varies the Office of National Statistics electoral statistics for 2015 state that the median total electorate across constituencies in Northern Ireland was about 68,200. How do you know which constituency you are in? The website theyworkforyou.com lets you search by postcode to find out what constituency you are in and who your elected representatives are. If you want to know more about your own constituency or any other constituency in Northern Ireland the Research Library Service of the Northern Ireland Assembly produce Constituency Profiles. They provide a statistical overview of each constituency that includes a demographic profile as well as key indicators of Health, Education, Employment, Business, Low Income, Crime and Traffic and Travel. Any changes must be agreed by both Houses of the UK Parliament.